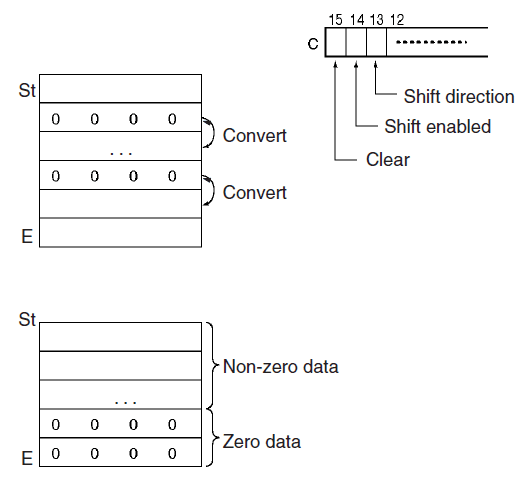 We will be looking at the data shifting instructions in the Omron CP1H PLC. Examples of some of the instructions will be presented. The instructions are used to shift data within or between words, but in different amounts and directions. 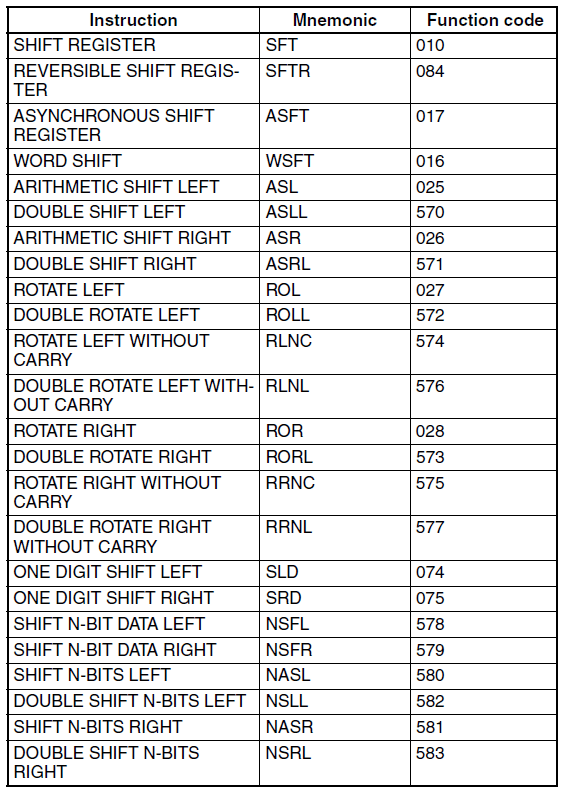 Several different data shifting instructions are available in the CP1H. A full explanation can be obtained by using the help menu in the CX-Programmer software or the Programming Manual for the CP1H. Links are provided at the end of this post. 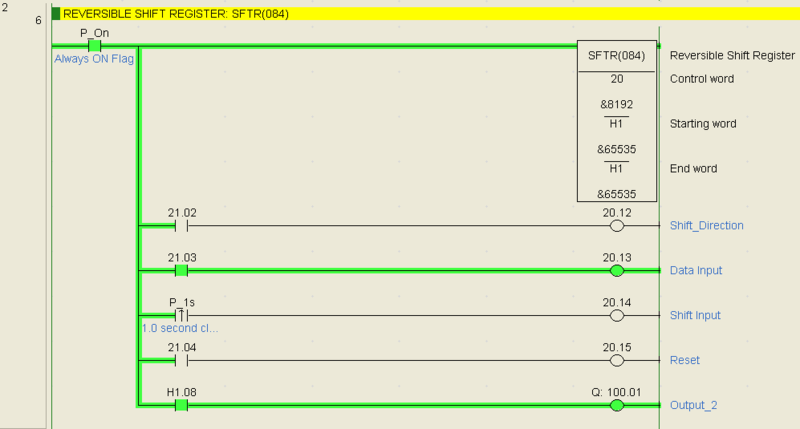 SFT(010) when used will be scanned and executed every cycle of the PLC that the input condition is on. @SFT(010) when used will be executed when the input condition turns from off to on. This will trigger the instruction to happen only once. Please refer to the programming manual or help file in CX-Programmer for different variations of the instructions that you want to use. We will now quickly go over the data shifting instructions in the Omron CP1H. See the YouTube videos below on data shifting in the Omron CP1H PLC. When the shift input condition is true the data input (1 or 0) will be put in bit 00 of the starting word and all of the previous bits are shifted to the left. 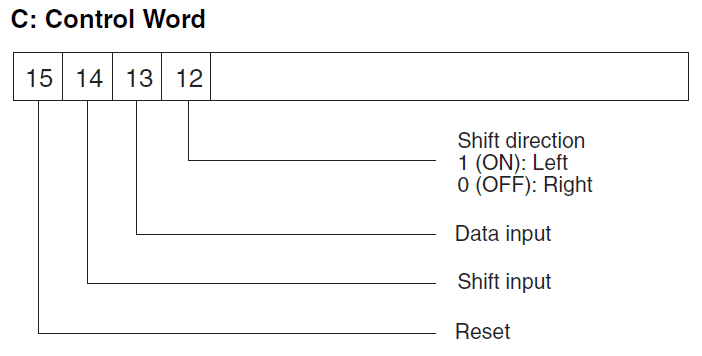 The reversible shift register uses a control word to get the inputs required. This instruction is similar to the precious, but now we can choose a direction of the shifting. The instruction uses a control word that will determine the shifting direction, shift enable and the reset bit. When the instruction is executed the information in the words are shifted in the direction set. Shifting continues until the non zero words are stacked together. 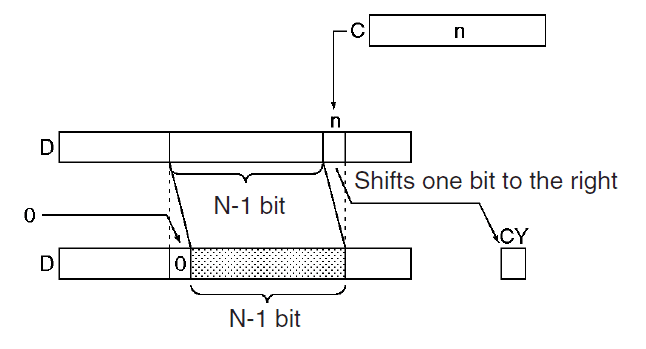 The word shift (16 bits) instruction will take the source word and move it into the start location each time the instruction is executed. Previous information is shifted from the start word to the end word. Information shifted passed the end word is lost. You will notice that in our example we are using a differentiated up on the 1 second clock pulse bit. This is used to trigger the instruction. Bits (00 to 15) in the word are shifted to the left. When shifting bits to the left you are multiplying the word by 2. In the following example we are using the @ASL instruction. This means that the instruction will execute once during an input transition from off to on. Bits (00 to 15) in the word are shifted to the right. When shifting bits to the right you are dividing the word by 2. This will shift all bits to the left in the word. It does not including the carry flag. Bit 15 of the word gets set in Bit 00 when the shift happens. You will notice that each instruction is a slight variance from previous ones. Each instruction has its own purpose and application. It is interesting to see how many ways bits and words can be shifted. This is the same as the RLNC instruction except that we are using two words. (32 bits) When bit 15 of the second word is on it will set bit 00 of the first word. This will shift all bits to the right in the word. It does not including the carry flag. Bit 00 of the word gets set in Bit 15 when the shift happens. This is the same as the RRNC instruction except that we are using two words. (32 bits) When bit 00 of the first word is on it will set bit 15 of the second word. A digit is 4 bits long. This is also referred to a nibble in computer language. This instruction will shift 4 bits (Digit) to the left from the staring word to the end word. The instruction will shift 4 bits (Digit) to the right from the end word to the starting word. This instruction will allow us to specify the number of bits in the word and the beginning bit to shift to the left. It is like having a mini shift register within the 16 bit word. This is the same as the NSFL instruction except we are now shifting to the right. We again specify the number of bits and starting bit to shift within the word. We specify the number of bits to shift to the left with this instruction. 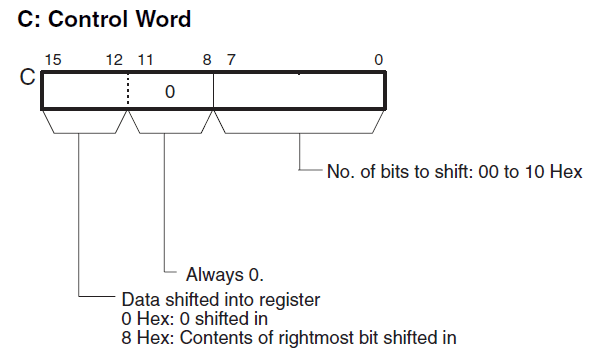 The control word will indicate the number of bits to shift each time the instruction is executed. 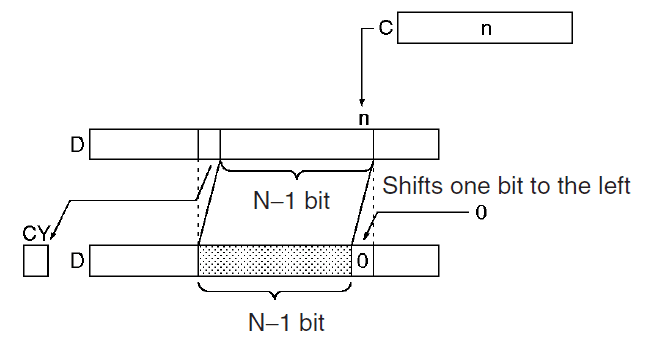 In our example we are shifting 2 bits to the left. This is similar to the NASL instruction except we are using 32 bits (2 words) in our shifting. We are shifting 4 bits to the left. This is like the digit shift left instruction. We specify the number of bits to shift to the right with this instruction. In our example we are shifting 2 bits to the right. This is similar to the NASR instruction except we are using 32 bits (2 words) in our shifting. We are shifting 4 bits to the right. This is like the digit shift right instruction. You can see that we have many different instructions to shift data in the Omron CP1H. This should give you a good idea of what is possible. Next time we will look at math instructions in the Omron CP1H PLC.